Written by Ralph Rainger and Dorothy Parker (yes, that Dorothy Parker), this song was first recorded in 1935 by Ruth Etting. 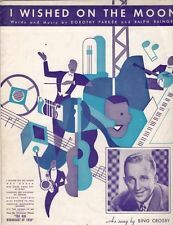 Bing Crosby sang in The Big Broadcast of 1936. Other recordings include those by Ella Fitzgerald, Frank Sinatra, Mel Tormé, Billie Holiday, Art Pepper and Tony Bennett. “I Wish On The Moon” was recorded in June 1992 and was released that year on Perfectly Frank. It was arranged by Ralph Sharon. “I Wished On The Moon” was recorded in June 1996 and released in 1997 on the album Tony Bennett On Holiday. It was arranged by Jorge Calandrelli.